Dr Vivienne Cox was appointed as Chair of the Rosalind Franklin Institute in 2018. A chemistry graduate with a passion for people and collaborative, interdisciplinary, ways of working, she will lead the development of the RFI Board – getting the right people in place, articulating a clear vision for the Institute, and establishing a strong strategic framework. Vivienne has wide experience of business gained in the energy, natural resources and publishing sectors. She also has a deep understanding of regulatory and government relationships. She worked for BP plc for 28 years, in Britain and continental Europe, in posts including Executive Vice President and Chief Executive of BP’s gas, power and renewable business and its alternative energy unit. Vivienne was previously a Non-Executive Director of BG Group plc and Rio Tinto plc and Lead Independent Director of the UK Government’s Department for International Development. Vivienne was appointed Commander of the Order of the British Empire in the 2016 New Year Honours for services to the UK Economy and Sustainability. 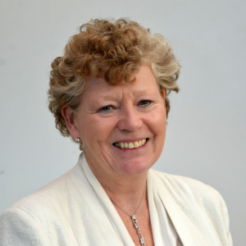 Vivienne is Senior Independent Director of Pearson plc, a Non-Executive Director of Stena AB and Chairman of the Supervisory Board of Vallourec, a supplier to the energy industry.